Banner art from San Rafael High School Colette Berkenfield, Ashley Maldonado & Jonathan Kfouri. 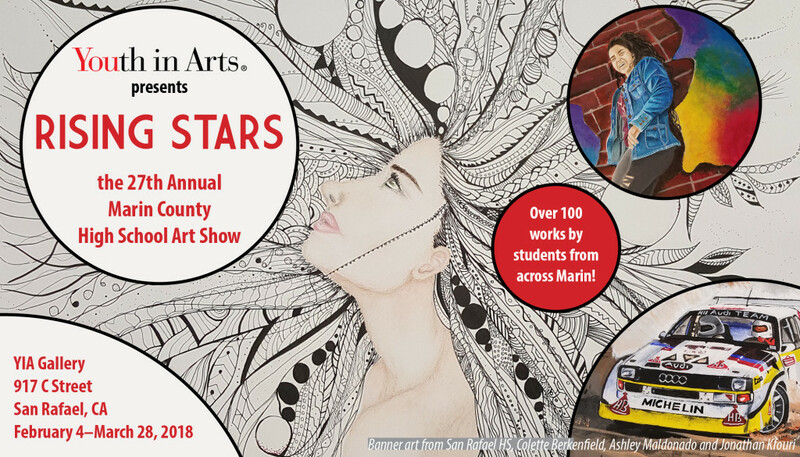 Join us for the 27th annual RISING STARS Marin County High School Art Show, featuring work by over 100 students from 17 different Marin public, private and alternative high school art programs. 2nd Fridays Opening Reception: Friday, February 9, 5-8 p.m.
2nd Fridays Art Walk Downtown: Friday, March 9, 5-8 p.m. RISING STARS is open to all high schools in Marin–public, private and alternative. Students are nominated by school art teachers and the exhibit is adjudicated by a panel of local professional artists. Prizes are awarded in multiple categories and most of the work in the show will go on to be exhibited at the Marin Center. RISING STARS was started by artist Susan Doglioni in 1991. She believed youth should be recognized and awarded for their talents. We are pleased to host RISING STARS at YIA Gallery, one of the only galleries in the nation dedicated to showing work by youth artists. Jurors: Kay Carlson, Joy Phoenix and Melissa Woodburn.